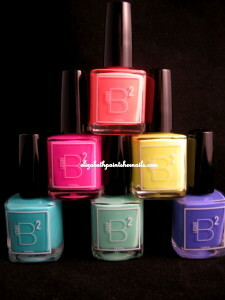 I have purchased more than a few polishes from B Squared. I have been very happy with all my polishes. The latest collection, EDM, is awesome for summer! Here is a shot of the entire collection – (start at the top, then left to right) Trance, Kandi, Rave, Plur, The Drop and Down Tempo. Formula is perfection! I tend to use three coats for all polishes, but on a few of the polish you might be able to get full coverage with two coats. The colors are so rich and full of pigment, no need for a white base (I am looking at you OPI, last year’s neon collection!). 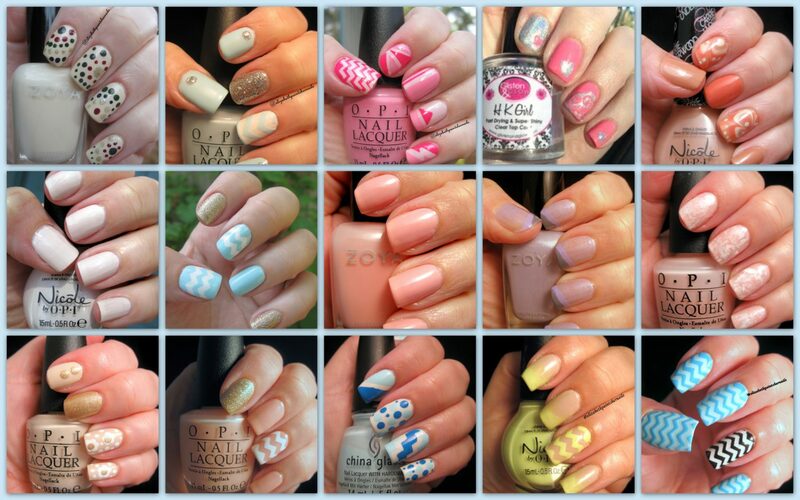 My first manicure with this collection was done with Down Tempo! I added two accent nails, using Cyclone Vinyls from Twinkled T and my old standby This Gown Needs a Crown (OPI). 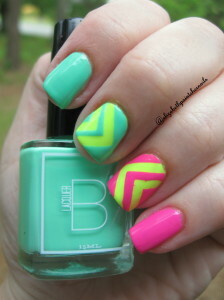 This is a very quick and simple manicure! I used Trance and Plur. Nothing fancy, but that Trance really pops against Plur, doesn’t it? The next manicure was done with another of my old standbys, OPI’s Don’t Bossa Nova Me as a base. then I used Trance and Kandi. These nails were done with Vinyls from Nailvinyls by Linda, I adore the right angle vinyls. Of course, as the photo shows, I used HK Girl by Glisten & Glow for my top coat. 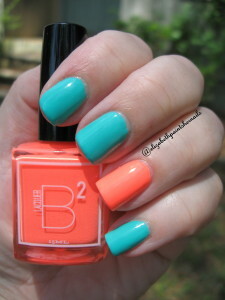 My last manicure from this collection! I used Plur, Rave and Kandi. 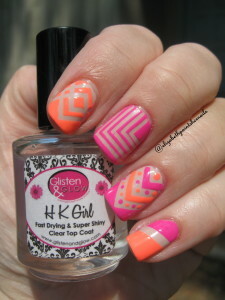 And I used the same right angle vinyls from Nailvinyls by Linda, and I used the same right angle vinyls. And of course, same awesome top coat by Glisten & Glow. 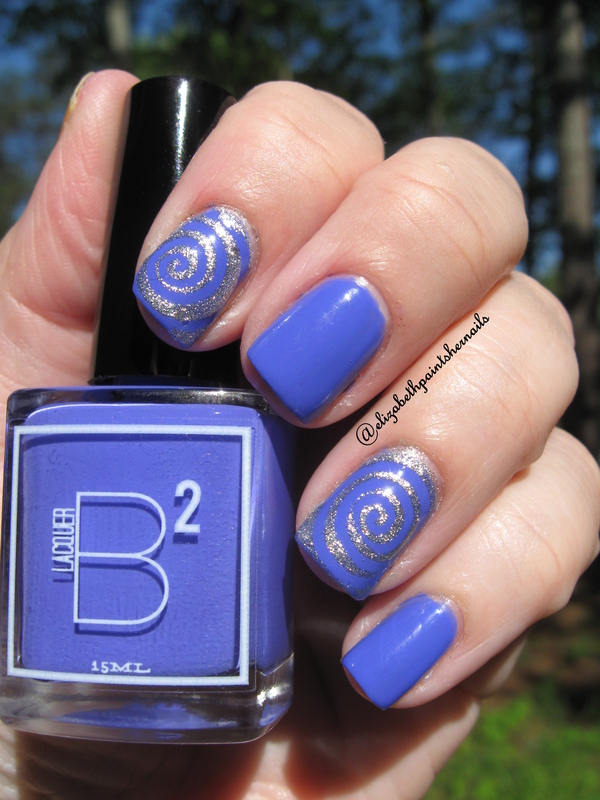 These polishes tend to sell out, so if you are interested, make sure you are following B Sqaured! !